... those who hope in the Lord will renew their strength. "At that time men will see the Son of Man coming in clouds with great power and glory. And he will send his angels and gather his elect from the four winds, from the ends of the earth to the ends of the heavens. "Now learn this lesson from the fig tree: As soon as its twigs get tender and its leaves come out, you know that summer is near. Even so, when you see these things happening, you know that it is near, right at the door. I tell you the truth, this generation will certainly not pass away until all these things have happened. Heaven and earth will pass away, but my words will never pass away. "Therefore keep watch because you do not know when the owner of the house will come back -- whether in the evening, or at midnight, or when the rooster crows, or at dawn. If he comes suddenly, do not let him find you sleeping. What I say to you, I say to everyone: 'Watch!' 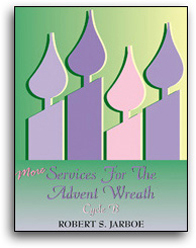 "
Reader B: The first candle we light this Advent season is the candle of hope. Our hope is in God who is merciful and gracious. Almighty God, as we eagerly wait for your return, our hope is that you not only establish your kingdom in our hearts, but in the hearts of all people. Amen.